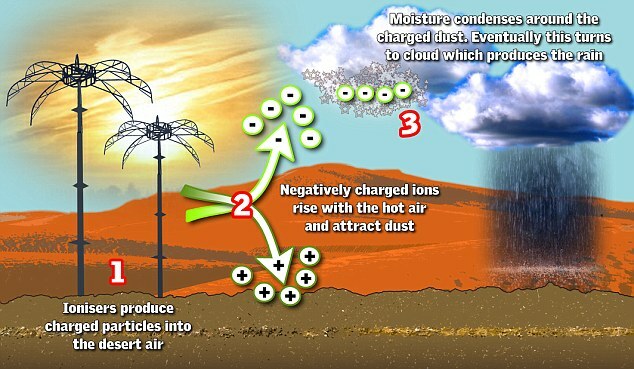 Fifty rainstorms were created last year in the state's eastern Al Ain region using technology designed to control the weather. Most of the storms were at the height of the summer in July and August when there is no rain at all. People living in Abu Dhabi were baffled by the rainfall which sometimes turned into hail and included gales and lightening. While the country's weather experts predicted no clouds or rain in the Al Ain region, rain fell on FIFTY-TWO occasions. The project was monitored by the Max Planck Institute for Meteorology, one of the world's major centres for atmospheric physics.